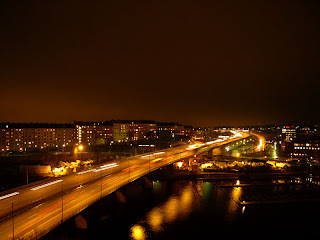 Essingeleden is the backbone of traffic in or through Stockholm. It is also a part of European route E4 connecting northern Finland with southern Sweden. This photo was taken from the heights of Fredhäll. Delightful! The sky in particular. what is this building behind the trees? and the not so icy man ?